You’re walking to your office. Suddenly, a gust of wind blows straight through you. Welcome to winter in DC. As you continue walking, you’re immediately grateful for the fleece-lined leggings you found deep within your drawer and even more so for the hand knit scarf of alpaca wool (God bless that alpaca) wrapped around your neck. What you’re not grateful for? The burning sensation on your face that comes with winter’s worst winds. This is basically a daily chronicle of my everyday commute into DC. An hour-long bus ride followed by a brutal, 10-minute walk uphill. While I’ve learned how to find the best trips and tricks for layering in the cold, there’s one part of my body that always seems to be the hardest to keep comfortable - my face. I don’t know about you, but winter is treacherous on my skin. Between the sudden temperature changes (again, welcome to DC), outdoor pollutants and the stresses of everyday life, our skin gets SO dehydrated. I was shocked to learn that our bodies go through 17 thermal shocks EVERY SINGLE DAY. It’s no wonder we have such a hard time keeping our skin is moisturized. No matter how much moisturizer I use, it never seems to last through the morning commute. But after trying our Clarins’ new Hydra-Essentiel line, I may have found a solution for quenching my skin’s thirst. This new line is a dry-skin-girl’s dream. With organic leaf of life extract (a highly-resilient succulent plant that boosts skin’s ability to retain precious moisture for all-day hydration) along with tons of other pure plant extracts, it moisturizes in a way that other products haven’t. And something I’ve been missing this time? Adding a serum to the mix (a mistake I surely won’t make again.) This combo together is like the Batman and Robin of skincare. Alone, they're still great. But together, they're best. 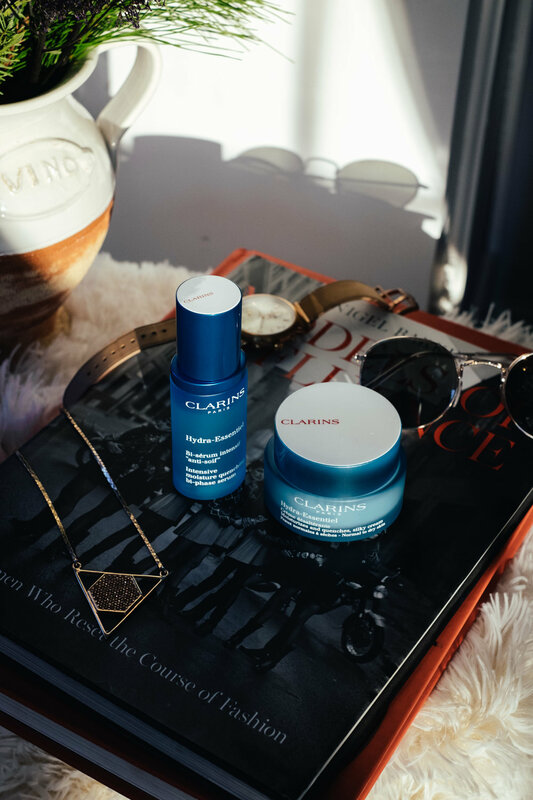 This post was done in partnership with Clarins. All opinions are my own. Hello, friends!! With Valentine’s Day under a week away, I wanted to share a cute little Valentine’s Gift idea with you!